Christmas may be over for another year, but if you are a Christmas-a-holic and you knit, here’s a project to keep you going until December. 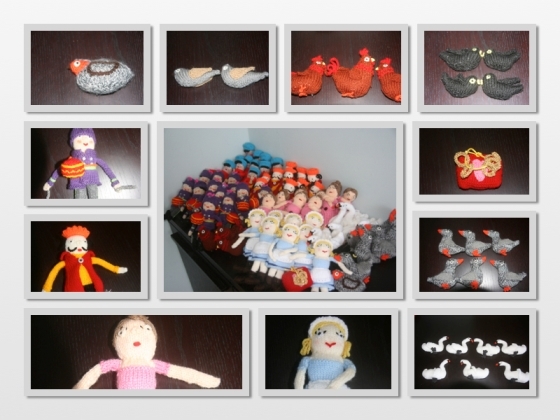 These are the Twelve Days of Christmas, in knitted form. Aren’t they amazing? The owner is a lovely little girl I know called Molly. The patterns are from a book called The Twelve Knits of Christmas, which, at the time of writing, you can buy used for £3.50. 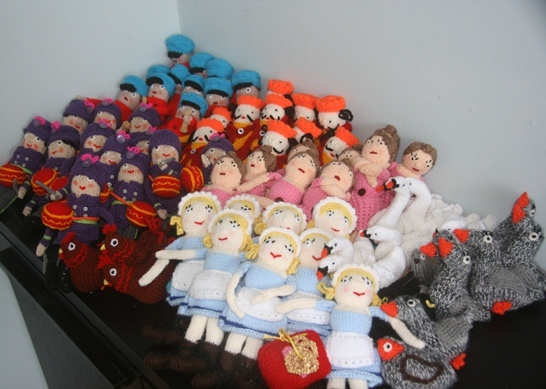 It strikes me that if you have leftover bits of wool from other knits, you can put them to good use here: look at all those little hats and caps and skirts. The figures have tiny buttons and buckles on their shoes, and the maids and dancing ladies have eyelashes. The very talented lady who made them all is Molly’s grandmother. Apparently it took her a year to do, in her spare time – so if you’re up to the challenge, now is the time to start! Molly is a very lucky granddaughter – because that, right there, is a labour of love. Miss T – Just to let you know, your Pinterest button seems to have gone. Ooh, so it has. Probably a result of the last WordPress update. Thanks for letting me know.